It gets the idea across powerfully, and it gets you banned from advertising in a local publication! People realize we can’t just keep on throwing things away; some embrace it as a value, others simply have to deal with diminishing free public garbage removal and diversion programs that are either mandatory, or the only way to avoid high bag-tag or dumping fees. The blue/grey box programs are pretty well known by now; we understand metal cans are sold for scrap, bottle glass gets crushed and re-used somehow, paper and cardboard get recycled back into new paper. But other forms of recycling are more complex. How do they work? One thing we discard at an increasing rate, although not quite as much as weekly trash, is e-waste (or e-scrap): all the electrical devices we get rid of as we upgrade, or as they break down. They are toxic in landfill or incineration, but don’t go in the blue box. So what to do with them? Well, this Saturday morning (March 29) you can bring them to the Earth Hour Super-Drive, hosted by Barrie’s Green Party on behalf of Off the Rack Free Clothing and the Barrie Food Bank. Along with donations of food items or used clothing, bring in your e-scrap and we’ll weigh it and pay you cash! The Super-Drive runs from 10 AM to noon in the parking lot behind 110 Dunlop St. W., off Toronto Street. What do we do with your e-waste? It goes to Barrie’s own GreenGo Recycling, the first company in Canada to pay the public for e-scrap founded by Recychologist Rudy Westerneng, a specialized broker for members of the public who want to recycle beyond the blue box. 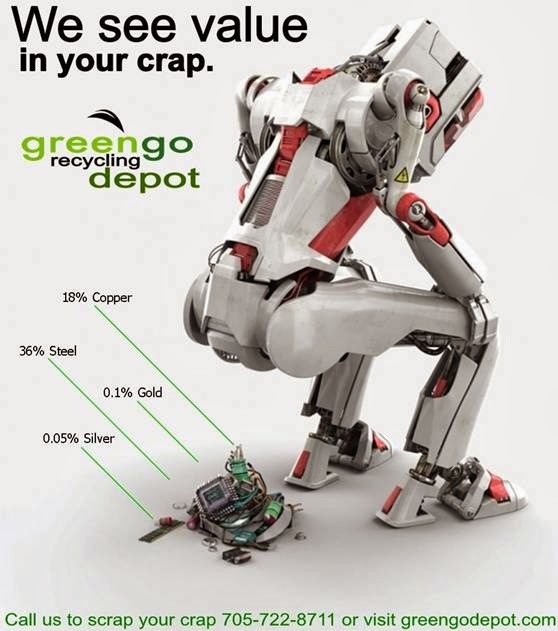 GreenGo collects scrap from the public, pays for it, then separates it by category before shipping it to a wide variety of end-of-line processors across North America. If you’ve ever heard Rudy singing in local radio spots, you’ll know that at “GreenGo Recycling they recycle everything”. Even better, they’ll pay you for most of it. Rates start low for steel, most e-scrap, batteries, and appliances, but metals like zinc, aluminum, stainless steel, brass, and copper command a premium, as do some electronics like PC towers, laptops, and cell phones, because these contain small but significant amounts of precious metals or rare earths. Another item worth a bit more is low-grade motors, because of their copper content. Think power drills, kitchen blenders, even electric toothbrushes. Rudy even pays for TVs (flat screen or tube), broken electric toys, lamps, vacuum cleaners, old fax machines or scanners or printers, cables, your mouse & keyboard, whatever had a plug or batteries or a chip or contains metal, even if it’s largely plastic. Some of these are valuable on the commodity market; others (like old televisions) are reimbursed from the stewardship fee you pay whenever you buy new electronics in Ontario. Think of it like a bottle deposit: pay when you get the new stuff, bring back your old stuff to get it back. As a participant in Ontario’s Orange Drop program, Rudy will also take your leftover or unused paint, and even has a rack where you can pick some up for free! He also buys unwanted clothing (clean & dry) for ten cents a pound, which either gets shipped to poorer nations for wearing or is ripped down to recover fibre, plastic, and metal. So whether you come to our Super-Drive this Saturday morning or visit Rudy’s GreenGo operation on John Street, there is no excuse for just throwing things away, or leaving them to gather dust in the basement, attic, garage or shed. Recycle it! Published as my Root Issues column in the Barrie Examiner as "Get rid of your e-waste this weekend in Barrie, maybe earn some cash"
Hour time has come, Barrie! When Occupy Wall Street moved on to projects like providing relief for victims of Hurricane Sandy or funding a rolling jubilee of debt buyouts & forgiveness, it left many people still eager to make a difference in the world. One was Donna Halliday, who knew she couldn’t change the world but could make a difference by weaving community ties. She founded Barrie’s Time Bank with a $1000 grant from the Huronia Unitarian Fellowship for web design and promotion, because time banking aligns with the Unitarian passion for social justice. After signing up some new members at last September’s Ecofest, the project caught the eye of Climate Action Now (Barrie), a vibrant new group of activists seeking local projects where they could be the “spark plug” to enable success. Time banking represents a form of re-localizing the economy, one strategy to reduce our carbon footprint and help address the climate crisis. So what is the Time Bank? Basically, it’s a way for you to offer something you can do, and receive something else in exchange, on an hour-for-hour basis. If you have a knack for sewing, or carpentry, or baking, you can provide that for someone else and take advantage of a manicure, or a facial, or someone to run errands. The beauty of the time bank is you don’t have to find a person who offers exactly what you need and needs what you offer; you provide a service to one person, someone else provides one to you, and the time bank squares it all up. It’s easy and free to register, and to start giving or getting. You can get a sense of activities by looking for the Barrie Community Time Bank page on Facebook, and click to their site where you can sign up. Current offers include gutter cleaning, rides, photography, manicures, classes such as yoga or forest kindergarten or ethnic cooking, while needs include electrical and carpentry help, or lessons in Spanish or sign language. Services are deposited or withdrawn on an hour-for-hour basis, because regardless how skilled or trained you may be, each of us has only 24 hours in the day. Time banking enhances people’s sense of self-worth and connection to the community. Even if you are unemployed, or a struggling single parent, there are things you can do for others that they will appreciate. Time banking restores the dignity of sharing and helping that used to fill our communities but has faded from our modern cash-transaction-based economy. There is no age barrier in time banking – children, adults, seniors can all take part. You can save up hours for a major project or use as you create them. You can even start by using a service, instead of having to give hours first. A working time bank needs withdrawals as much as deposits! Another project supporter is Transition Barrie, because time banking increases community resilience. After the devastating New Zealand earthquakes in 2011, a well-developed local time bank served as a vital hub, coordinating clean-up and rebuilding efforts by matching available assistance with people in need. If you’re intrigued by time banking but want to understand it better, drop by the Saturday Social on March 29th, between 5 and 9:30 pm at the DIY Arts Collective at 67 Toronto St. Computers will be set up where you can try it hands-on, with activity stations for children, and even a brief candle-lit Earth Hour ceremony. Time is money – so bank it! Published as my Root Issues column in the Barrie Examiner as "Time banking a form of re-localizing the economy"
As Earth Hour approaches, preparations for the Barrie Green Party’s fifth annual Earth Hour Super-Drive heat up. Once again, this event combines clothing & food donation drives for Barrie’s Free Clothing Centre and Food Bank with an opportunity for you to bring your old electronics or other e-waste in and get cash back for it. Yes, anything with a battery, plug, or chip can be recycled (through our partner GreenGo) instead of going to landfill, and you get paid by the pound for your trouble. As usual, it’s the Saturday morning of Earth Hour (March 29th 10 am to noon), in the parking lot off Toronto Street behind 110 Dunlop St. W.
Earth Hour aims to make us mindful of our energy use’s ecological footprint. Even as we unplug, more and more of our world runs on battery power, and those batteries become a real problem once used up and discarded. If you visit websites of major battery companies like Duracell or Energizer, they will tell you batteries can’t be recycled and you should throw them out with your garbage. Yet Barrie’s own waste calendar urges you not to do that, and even more importantly, batteries can indeed be recycled, right here in Ontario! Raw Materials Company (RMC) in Port Colborne has actually been recycling alkaline batteries since 1989, using their own mechanical process that separates the batteries into components, some of which (zinc, manganese, potassium) are “upcycled” as agricultural fertilizer and some of which (steel and other metals) are recycled back into the metal supply stream, with the remainder (cardboard and plastic) being used to generate process energy to reduce carbon footprint. And the connection is even more local than that – recently I spoke with executives at RMC’s local partner LEI Electronics Inc, headquartered right in here in Barrie, who have proudly pioneered and patented the Eco Alkalinestm battery brand. Although it’s still best to recycle them, these batteries are completely free of toxins like cadmium, lead, or mercury (not even trace amounts) so are harmless if they end up in landfill. And that’s important, because apparently only about 2% of batteries currently make it into the recycling process. As partner & VP Lionel Lalonde explained, LEI’s passion for the environment goes much deeper. Their non-toxic battery line is certified as carbon-neutral, and they use 80% recycled material in all of their packaging. They have done everything they can to go the extra step and make a sustainable battery product, from factory to shelf to disposal, while keeping their prices in line with the market and their battery quality equal to the leading brands, those efforts earning them LEED certification. Sadly, the two leading brands have almost a strangle-hold on retail shelves, so if you want these green batteries, you’ll need to order them online for now. But Eco Alkalinestm have seen much greater success at the institutional level, being used by governments, colleges & universities, theme parks, the Canadian Forces. Unfortunately, there is a chance that Ontario’s battery recycling might be captured by a project of the major suppliers, resulting in our batteries going to a smelter in the US instead of the cleaner and more thorough process invented right here. It’s all up to Waste Diversion Ontario, our provincially-mandated stewardship organization, so be sure to let your elected officials know that you want batteries fully mechanically recycled in Ontario instead of shipped to the US to be burned and melted into slag.